"If I felt something strongly, I would make a photograph that was the equivalent of what I thought and felt." The photographs are so beautiful, so iconic, that it's hard to conjure up images of the American West that don't bear the imprint of the work of Ansel Adams. And his oeuvre has been so popularized�greeting cards, calendars, dorm room posters�that it's easy to lose sight of Adams' aesthetic and technical accomplishments. But he was far more than someone who made pretty pictures of mountains, and Ric Burns' fine documentary, now on DVD as part of PBS's American Experience series, is an opportunity to revisit some of Adams' work, and to situate him more solidly in his time and place. The filmmaking style is pretty straightforward—interviews with Adams' children, friends and colleagues, archival footage of Ansel at work and at play, actors reading from his letters, all yoked together by an informative narration track supplied by David Ogden Stiers. Adams was born in San Francisco in 1902, and one of the recurring tensions of his life was between city and country, between San Francisco and Yosemite. Similarly, he was a gifted pianist, and he wrestled between music and photography—the solitary art of taking pictures won out, as did the pull of the wilderness over the temptations of the big city. (His father gave him a Kodak Brownie for the family's inaugural trip to Yosemite, and the history of photography became that much richer.) Appropriately enough, he met his wife and was married in Yosemite, the place that enchanted him even before his first visit there, in 1916, until his death in 1984. What's striking about Adams' craft is how resolutely modern he was—the popular trends in photography had been toward a sort of artiness, emphasizing soft focus, making the images almost gauzy. But Adams' crystalline prints were something else entirely, emphasizing the clarity, the particularity, the evanescence in capturing actual objects in actual time. He wanted, as he said, "to make a mountain look how it feels." But he was more than merely a nature documentarian—though he wasn't a churchgoer, there was, as is discussed in the film, a "quasi-religious sense of identification with landscape." Ansel apparently always felt a little hinky when he got east of the Rockies, but his trips frequently proved fruitful—in 1933, he traveled to New York for an audience with photographic master Alfred Stieglitz, who looked at Adams' portfolio and declared, "These are some of the finest photographs I have ever seen." What's especially notable (from, for instance, footage of Adams' solo exhibition at Stieglitz's gallery) is the small size of Adams' prints, these almost delicate images of the great granite mountains of the west—if you're used to seeing Adams' pictures in great oversized reproductions available for framing from museum shops, it's a little startling to see the pictures just as they had come from the photographer's darkroom. Adams' most fruitful artistic period coincided with the Great Depression, which established a tension between him and others in the photographic community—the champions of the likes of Dorothea Lange and Walker Evans displayed a certain disdain for Adams, who, as the country wrestled with economic calamity, was shooting rocks and trees. But Adams was resolute about his artistic vision, and felt, rightly, that his aesthetic contributions were resolutely American, in the best sense. But for those of us who didn't know him, of course, what matters more than the artist is the art, and Adams' legacy remains a substantial one. That, twinned with his devotion to the Sierra Club and environmentalism, make him a worthy subject for this well-crafted documentary. Image Transfer Review: As is fitting for a film about an artist with Adams' precision, the DVD transfer is crisp and largely free of interference or debris. Adams' photographs are shown off to good advantage, and the recent interview footage is shot warmly and with subtlety. Audio Transfer Review: Stiers' narration track occasionally sounds rather too loud, which makes this classically PBS voice-of-God narrator seem like an angry god. Also, the accompanying musical score is nice, but there's a little too much of it for my taste. 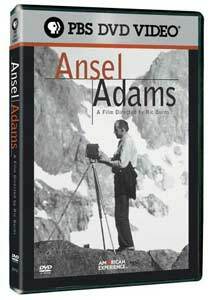 Extras Review: The disc offers links to various websites�one for this film (which promises info on, among other things, how Adams' view camera works), another for The American Experience, and still another for PBS. Those and chapter stops are the only extras. A stately look at one of the most accomplished and renowned American photographers, Ansel Adams will bring you closer both to the man and the work, a formidable and worthy accomplishment for any documentary.